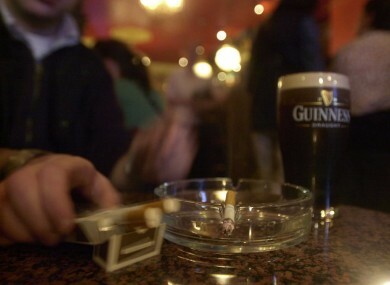 Despite the extra incentive to give up, more employed people smoke after the smoking ban. UNEMPLOYED PEOPLE SMOKE less now than when the smoking ban was introduced, but those in workplaces have barely been affected. The findings come in an ESRI working paper published by Michael Savage on the effects that the ban has had on the numbers of people who smoke. The numbers were based on National Tobacco Control Board figures up to mid 2008. The report found that the ban had “little or no effect on reducing smoking habits” on employed people. The report says that the 2004 ban provided employed smokers “an extra incentive to quit” and aimed to discover if this was incentive enough for people. However, the report says that working people were undeterred by the ban. The workplace smoking ban did not induce a greater reduction in smoking prevalence compared to any of the control groups in the analysis. In fact, the evidence suggests a significantly larger decrease in smoking prevalence among the non-workers relative to the employed. In 2002, 22.9 per cent of workers smoked, but by 2007 that number was up to 24.8 per cent. Of those not working, 46.4 per cent of unemployed people smoked before the ban, but 0.5 per cent stopped after. The report says that by mid-2007, the NTCB was reporting a 95 per cent compliance rate with the smoking ban, suggesting that the ban has succeeded in its primary aim of cutting passive smoking. But, despite the extra incentive for people to give up smoking, identified in the report as an “economic” one, people who are unemployed have seen a bigger decrease in those smoking. Email “The workplace smoking ban hasn't stopped workers smoking”. Feedback on “The workplace smoking ban hasn't stopped workers smoking”.